When we use the acronym HVAC, most homeowners know we’re talking about their furnace or heating (the “H’) and their cooling or air conditioning (the “AC”). But how many remember that important “V” in between? It stands for ventilation and is often overlooked by homeowners as an equally important part of their overall HVAC system. Proper ventilation — including that provided by a ventilator or air exchanger — offers some major benefits that every homeowner should know about as well as different ways to improve airflow in your system. Keep your family healthy by eliminating allergens and pollutants such as mold spores, viruses, VOCs (volatile organic compounds) and radon gas (the second leading cause of lung cancer). Help to control moisture in the winter months preventing window condensation and helping to inhibit mold and mildew growth. (In the summer months) help keep you cool in the same way as opening a window, but without the security concerns. Those are three great reasons to know how to improve the ventilation in your home. And here are three basic approaches. Natural infiltration is just a fancy way of saying “fresh air." This happens when outdoor air enters your home via open doors and windows and through cracks and crevices. It’s by far the least expensive route, but it’s also the least reliable. That’s a good point and why many homeowners add some type of mechanical ventilation to their homes. The next step up from natural ventilation is a basic-powered system. Keith says the simplest powered system uses an electric exhaust fan or blower to pull stale air from the home. Unfortunately, this system can cause problems with natural drafting chimneys and vents, Keith says. For example, a down drafting chimney — one where the pressure pulls the outside air back in the home down the chimney — can be dangerous. If you have a fire going, the flue gasses like carbon monoxide can re-enter the home instead of getting pushed out. So, if you’re looking to save money, getting a more efficient system is both cost-effective and beneficial to your health. 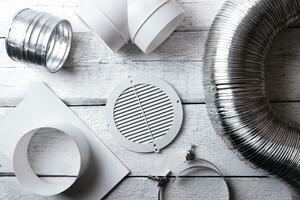 The best ventilation systems have an equal balance between exhaust and fresh air. That means there’s no negative pressure in the home and there’s a transfer of heat leaving the home into the incoming air. There are two types of balanced systems. An energy-recovery ventilator operates by exchanging both heat and a certain amount of water vapor. It brings in fresh air, removes the humidity, then distributes that air through the home. A home cooling system with an ERV won’t have to work as hard, thereby saving energy and money. ERVs are designed for climates with long, warm, and humid summers. In northern climates where summers are shorter and generally less humid, an HRV is the best choice for optimal air quality. An HRV works by transferring heat from the warm inside air to the fresh, colder, outside air. Once heat is transferred in the HRV system, it can enter the house’s atmosphere. Despite the name, an HRV will still pre-condition air to cool in summer, as well. An HVAC system with an HRV saves energy and money because it won’t have to work as hard to heat and cool your home. If you're interested in learning more, check out this quick video on how an HRV works. Although ERVs and HRVs are not standard equipment with most HVAC systems, they’re worth investing in if you want the best air quality possible, coupled with greater energy efficiency. To find an HVAC pro who can help you select the ventilation that’s right for your home, just use our convenient dealer locator. How Can I Trust Furnace Reviews? What To Ask Before Investing.